A mobile-friendly site for parents and kids with ARTHUR video, games, stories, and digital supporting materials. 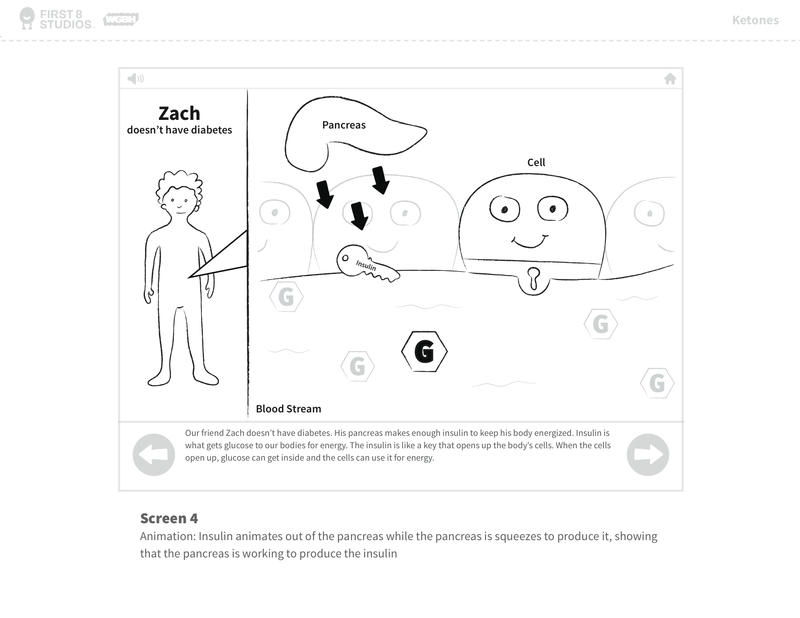 A partnership to bring diabetes information into the digital age. Conceptual designs below show how we are developing materials for doctors to help convey complex diagnoses to children. Move It! Shake It! is a teacher-controlled fitness program for preschoolers being developed by WGBH with researchers at the Hood Center for Children and Families at the Geisel School of Medicine at Dartmouth. The Arthur Interactive Media Study (AIMS) project uses innovative educational media to support research into the development of prosocial behaviors and attitudes among elementary school children, bringing together leading experts from the Tufts Institute for Applied Research in Youth Development and the ARTHUR team at WGBH. We have developed outdoor games for both fitness and environmental awareness as part of a growing Outdoors Rx project associated with WGBH’s Plum Landing project. Funded by the US Department of Education, FFFBI Academy is a partnership with the Alvin V. Baird Attention and Learning Disabilities Center (ALDC) at James Madison University. It’s designed to help middle-schoolers with attention issues manage schedules and distractions at school. Illustrated is one of several projects in development to help kids on the autism spectrum. Research and development continues on many emerging technologies and platforms. In this game we hooked an ARTHUR asthma game to the Wii to allow kids a full-body experience as they dodge asthma triggers like dust and mold. We have developed many games focused on ideas of nutrition. Illustrated here is one such, a collaboration with Hive5 and the Hood Center. We created a bilingual patient’s guide for kids for Boston Children’s Hospital. Also pictured are health games from Stepping Stones Museum in Norwalk, CT and from Kansas City Chiefs’ new exhibition hall.